Stampin' Up! is getting ready for the holiday season and thought you'd be interested in a special offer to help you get ready for the holidays too. From now until November 3, you can get the exclusive Wishing You Cheer stamp set from our 2007 Fall-Winter Collection for 20% off the regular price! To take advantage of this limited-time holiday offer, simply contact me by phone or email and give the promotional item code: 112015 and any other products you may need. You'll receive this beautiful stamp set in plenty of time for all your holiday projects! Contact me today-before this limited-time offer ends! 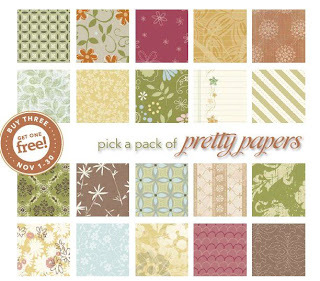 Purchase any three Designer Series Papers and get the fourth one ($9.95 value!) FREE! No limits, no restrictions! Dave Abbott, Australia General Manager passed away last month from a rare blood disease, and during November Stampin' Up!© is donating 100 percent of the sales worldwide from the All in the Family stamp set to the Dave Abbott Family Fund. If you've considered purchasing this set, please support this effort to raise money for the family and order your set in November. Be sure to ask about the special Holiday Glitz Card kit promotion going on while supplies last.